On September 2, my brother and his wife will be married for 38 years. Their Labor Day weekend wedding was notable for several reasons: his was the first wedding in our immediate family; he got married on our youngest sister’s 21st birthday; the drama of the dress my Mom wore to the wedding. Why would a dress be so memorable? Here is what happened. My sister in law chose orange, yellow and beige as her wedding colors. My mother did not want to wear beige, as she felt it was too close to the bride’s white dress. But she could not find a dress anywhere, in a color she liked. She decided to have one made specifically for her. She chose an orange/peach color fabric, with a lace inset at the top. As a teacher in West New York, she knew many people. Someone recommended a good dressmaker. The dress was well made, but it looked absolutely horrid on my Mom. I can still see the dress, even though she never wore it to the wedding, just tried it on for us. My husband and I, who were engaged at the time, arrived in New Jersey about four days before the wedding. That evening, my Mom tried the dress on for all of us. My Dad, my sister and I stared at the dress, without words. Mom looked horrendous. The color was WRONG! It took all color from her face. The style was also terrible. She looked like she was wearing a nightgown to go to bed, NOT a gown to wear to a wedding. My sister and I were stunned. We were silent for a few minutes. We actually had no words, no way to tell her how terrible this dress looked. Mothers and daughters have a connection, from our silence, and probably the looks on our faces, she could tell. “It looks horrible, doesn’t it,” she asked…or something like that. Then the tears started. The wedding was just four days away. What would she do? We had a major disaster on our hands! My sister and I were up in an instant. We would do something! My father was somewhat calm. “DO not worry. You will find a dress.” He was positive. But he was also insistent that she no longer tried to save money. This called for emergency shopping, and we knew the perfect store: Gail Browns, located on 58th and Bergenline Avenue. (Thanks North Bergen friends for this info.) It was a high-class dress shop near by. A store that we never shopped at because the prices were way too high for us. We usually went to Little Marcy’s, occasionally Corduroy Village, but never Gail Browns. The next morning, as soon as it opened, my sister, my Mom and I went to the dress store. With in minutes, the sales lady brought over a beautiful beige dress with a brown belt. It was the same exact color as the tuxedos the men were going to wear. Mom put it on. Stunning. Mom in her lovely dress stands in the middle surrounded by my grandmothers, my sister and me. Yes, there were just a few minor alterations. The hem had to be shortened; the belt loops moved; an extra snap on the bodice. But the seamstress knew it was an emergency situation. This was Friday. The wedding was Sunday. By late afternoon, the dress was complete. I believe they even dyed shoes for her! The Dress Fiasco was over. The discarded dress disappeared. Never to be commented on ever again. Mom looked wonderful at the wedding of her oldest child. She looks lovely in all the photos. There is a picture of my Mom and Dad dancing that I can still see in my mind. It was a great dress. I missed Mom when I purchased the dress for my daughter’s wedding last year, 37 years later. She also got married on Labor Day Weekend. My Mom is no longer with us. She did not get to go dress shopping for this wedding. Instead, my daughter and I went shopping, and narrowed the choice to two dresses, which I brought home. Later that day my sister arrived from New Jersey. I tried on both dresses. I took the advise of my sister and daughter who both loved one specific dress. They said it was me. The other dress, which was grey drained me of color. Another dress fiasco was averted. I wore the lavender dress that they loved. Now my sister is facing this hurdle. Her daughter is getting married next June. I know she realizes that I will be there to make sure that her dress is the perfect one. There will be no tears four days before another wedding because the mother’s dress is horrendous. No more dress fiascos ever! I was 3 ½ when my family moved from West New York, NJ, to North Bergen. The reason for the move was the soon to be arrival a new sister. The apartment we lived in was too small with only two bedrooms. So we left the safety of West New York, and my grandparent’s bakery, to venture off to North Bergen. We lived in a three-family home, we had the second floor. Next door was a family with one daughter, known here as DAS, who was a bit older than my brother, and 18 months older than me. DAS became my buddy. We loved each other, even though over the years she almost killed me several times and got me into the biggest trouble ever! But I guess it does not matter. We are tied together though the bonds of our childhood memories, the close friendship of our parents, and shared memories that no one else, but my siblings share. DAS has to love me for life for all she has done to me over the years. And I tell her that. I have written in another blog about being pushed through a basement window and almost dying. That was DAS. I have written in a different blog about hitchhiking with a friend, even though my parents had forbidden it. Yes, that was DAS. Or the time we almost killed my brother by tying a rope across the driveway and pulling it up just as he rode his bicycle toward us. Yes DAS! I could write about smoking my first and only cigarette…YES DAS. Or even my one time of shoplifting as a tween. DAS! She dared me and told how to do it. Or the time I broke my big toe walking on cinderblocks after my grandfather specifically told us not to do it! Since my parents are no longer alive, I can now tell all. So over the years, I have complained to DAS about her being the cause of my biggest troubles as a child. Oh, I admit she was also the cause of some of my favorite memories. It was not all bad with DAS. I have known DAS for 59 years. That is a long time for a friendship. I won’t go through the years we did not see each other. It does not matter. What does matter is that now, even though we grew up in New Jersey, we live just three or so hours apart in the Midwest. I live in Kansas and she lives in Arkansas. And over the past few years we have tried to see each other several times a year. This summer it was mine turn to go visit her. My excuse was that I wanted to see the Chihuly exhibit at the Crystal Bridges Museum in Bentonville. I did write about the exhibit. (See below link). That is not my issue here. The issue here is that DAS is still trying to kill me. Not on purpose, but it happens. First night in her house. She tells me that she cannot use the shower in her bathroom, she needs to shower in the guest bathroom. Okay, so when I was done, I went to her bathroom to brush my teeth while she showered. I think she forgot I was there, and turned off all the lights while I was in the bathroom. Luckily I remembered that when I left her bathroom (up three steps) and then walked through her bedroom into a small hallway, there were two little steps somewhere. I could not see them. I did not know where the light switch was, so I walked very carefully. It did not matter, I hit the steps and fell to my knees. Luckily I was going up! So I really did not hurt myself too much. “You turned the lights out. You tried to kill me for the 59th time!! !” I yelled back, while rubbing my knees. She was sorry. And I forgave her. Something, I have been doing for along time. And I thought we were done. One death per weekend seemed enough. But the weekend was not over. We still had the Chihuly Exhibit to see. The day time went fine. We went to Crystal Bridges by car, it was hot in Arkansas, and walked through the museum. We had a fabulous time. 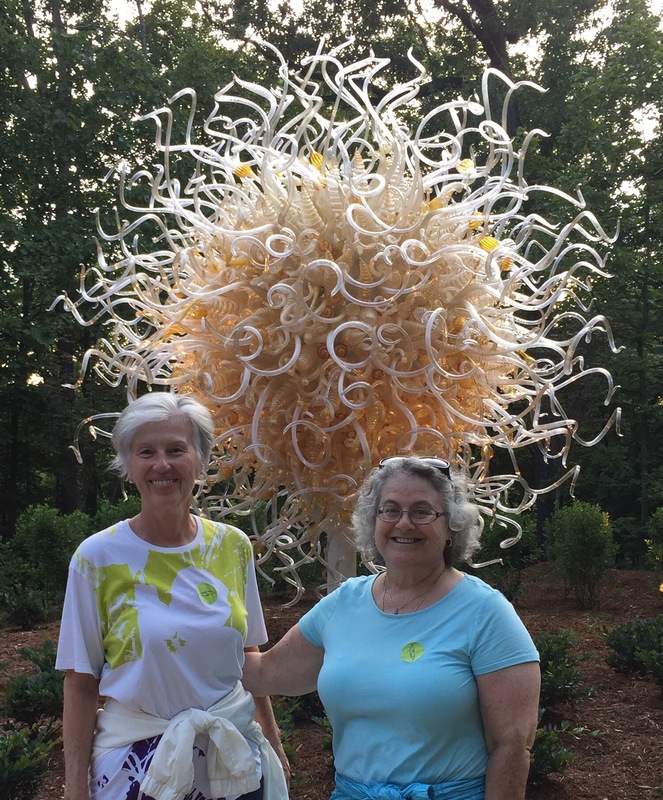 We both love the blown glass masterpieces designed by Dale Chihuly. We had lunch. We visited. We got ready to go to the Chihuly Exhibit in the Forest. This is where we made our mistake. The museum is in walking distance from my friend’s house. So we decided to walk. We both love to walk and were used to walking a mile or two every morning. 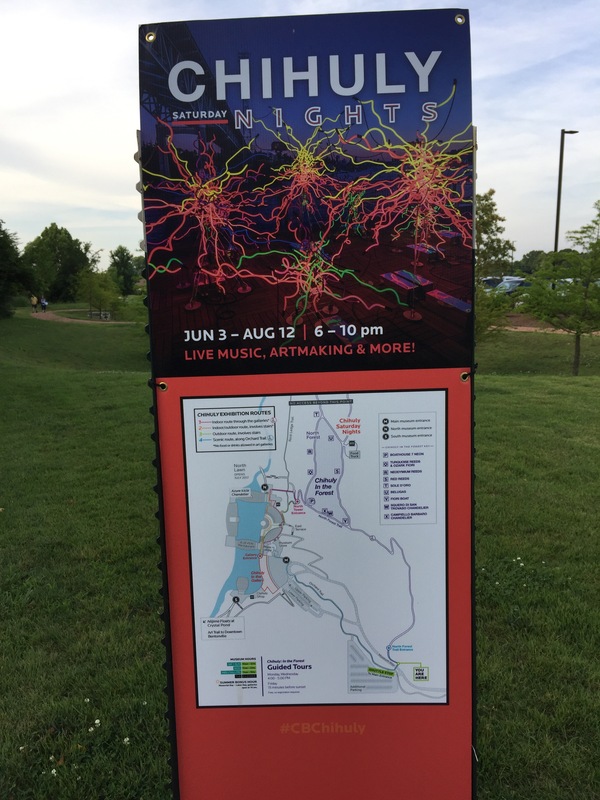 But we did not check where the outdoor exhibit was located. We did not know that it was actually about two miles away. And so we walked and walked and walked. Up and down paths, past the museum, up a hill into the Chihuly in the Forest exhibit. We made it to Chihuly in the Forest, now we have to walk back! We made it. We walked all around the paths. We saw all the wonderful Chihuly. But we realized we made a big mistake. We had to walk all the way home. And if we waited too long it would be dark. Walking those trails at night was not a good idea. So we headed back before dark. We went back down to the Museum, through the paths, across the parking lots, up the hill, back to the streets of Bentonville. Needless to say, I lived. And I loved the Chihuly exhibits. I learned where the light switch was in her home. I guess I am always ready for another DAS adventure. Among my parents collection of photos and memorabilia were several little booklets of black and white photos called a Peek-A-Pix Album. When we went through their home, we sorted through the photos, and I took home all that looked important or interesting. So now, whenever the mood strikes me, I take out the bag of photos and search through them. Since it was 99 degrees outside today, I decided today was a good day to look at photos, specifically ones of snow. Why not? It might cool me off! I remember the big snow in North Bergen, NJ, when I was five years old. School closed. The roads closed. Dads could not go to work. It was a wonderful holiday from life. Even without these photos, I remember this snow storm. I remember the work and effort to get into our snow clothes. I especially remember my sister. She was only 2 1/2 at the time. My Mom got her all bundled up, when my sister announced that she had to go potty. Mom sent my brother and I downstairs to join our Dad, while she dealt with my sister. Ready to sled down the backyard mound. The Dads were all very busy shoveling. Shoveling out their cars, shoveling out the walkways, shoveling out the streets. You really could not go anywhere. But all this shoveling created the giant mounds of snow that we could climb on! I still remember climbing to the top of a giant mound of snow on Third Avenue. My brother, neighbors and I were all playing King of the Mountain. It wasn’t until we had been jumping and scrambling up this mountain for a while, that the green top of a car was exposed. The snow pile was so high, we were able to climb on top of a car! That made a major impression on me. My Dad and my friend’s Dad, (they lived next door), made a giant mound of snow for us in the back yard. We could sled down from their back porch into the relative safety of their yard. I have pictures of the three of us and our sled. You can barely make out our faces as we are so covered with clothes. My sister and my Mom…In the background the window where I almost died. One of my favorite photos shows my Mom and my sister at the corner of the house. My sister is hiding from the camera. But that is not the exciting part for me. If you look closely you can see a basement window. That window almost cost me my life, one spring day, when my friend accidentaly pushed my head through that window. Luckily the Dad’s were home. I remember my Mom standing upstairs yelling at me not to move, while the Dads went into the basement to figure out how to get me out without cutting my face. It was scary. But as an adult, I am glad to see the window as in reinforces my memory. It really did happen. I love seeing the backyards and all the old garages with their wooden doors. Each photo brings back memories of the cold and the snow. But most of all it brings back memories of the fun we could always have on Third Avenue. I know I will never forget the Big Snow.